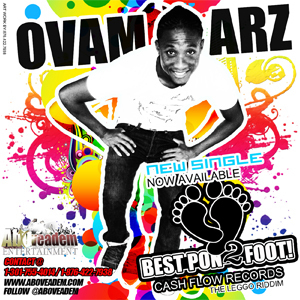 In light of Olympic theme songs created by artistes such as Masicka (Jamaica Guh Haad and Done), Cherine Anderson (Jamaica Tun It Up) amongst several others, Ovamarz recently unveiled his own tribute to Jamaica’s Olympians with his aptly titled track, Best Pon 2 Foot. According to Ovamarz, the inspiration for Best Pon 2 Foot was sparked after a female fan declared him as the best dancer she knew. For Ovamarz, it was a joy to watch Bolt and other athletes mimic dance moves that he and other prominent dancers coined. Going forward, Ovamarz looks to add to his repertoire as he seeks to delve within the promotional ranks while involved in a number of charities. Furthermore, Ovamarz will celebrate his birthday with a party at O’Neil’s Place in Kingston on August 18.